Lady Brown, beloved Mother and Grandmother, was called to her eternal resting place on April 20, 2017. She entered this world on August 28, 1933 in Lawn, TX, born to Asa and Hazelle McMillon. 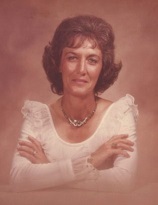 She was preceded in death by her husband, Butch Blankenship; eldest son, Rickey Blankenship; parents, Asa and Hazelle McMillon; brother, Don Parker McMillon; and grandson, Andy Blankenship. She is survived by her son, Nickey Blankenship of Cooks Point, TX; son, Danny Blankenship (Tammie) of Abilene, TX; and daughter Jennifer Brown-Carlton (Tracy) of Corinth, TX. She is also survived by grandchildren, Machelle Blankenship, Brandy Blankenship, Adam Blankenship, Tana Blankenship, Preston Carlton and Ashley Carlton. A graveside service will be held April 23, 2017 at 3:00PM at McBee Cemetery in Ovalo, TX.